i've noticed i'm pretty burnt out with painting. i start one and it doesn't go smoothly and i get stressed and lose the muse with my idea so start another one with the same result. it's the stress of expecting each painting to be presentable for the show in february. i can't paint with that expectation on me, so i've decided to let myself off the hook with painting on canvas until after i'm set up for the show! that should cover THAT anxiety. but, i've been waking in the middle of the night with show anxiety and having to go downstairs. just need to concentrate on my tasks and get myself to the finish line. i have 17 canvasses that are ready to show. that is, i'm not fiddling with details on them anymore and they are varnished. of those, i think only one has wire for hanging. we never got to that over the weekend, so i must wire 16 canvasses sooner rather than later. i also have to make sure i know each canvas size and calculate their price point. math and i are like oil and water, so i will do the calculations and bring them to the hubster to verify. honestly 17 is a reasonable amount of paintings to show. they are of differing sizes and prices, and i'm sure they will show well as a group. i don't need to worry about the amount of paintings, i have enough and there have been shows with less on the walls. i also need to remember that i will have 20 of my mini canvasses there as well. my art will be well represented. i realize it's only october, so i have 3 months before crunch time starts, but my mental health warrants i get these tasks done as soon as possible so i know there are no loose ends to concern my head about. that the only worries i will have are the ones i make up. honey told me the other night after i told him i was stressing, "you know, only like 30 people will see your paintings. it's a small room in a small library. more people see them when you post them to Facebook!". he's right. i know he's right, but there is something more personal when someone can get real close to your paintings and scrutinize them or touch them (which i hope they don't!). i feel more vulnerable sending them out into the world like that for a whole month. but, like myself, they must grow up and see where life takes them. my birthday went well. sweetie took the day off to be with me on my special day. i woke ridiculously early and went outside as the full moon was calling. the first sight that caught my eye when i went out the door was the constellation orion, which represents my son, winter-orion. it was a very sweet birthday greeting from him, and i felt it to my bones! after saying good morning to winter and grandmother moon and resisting the urge to howl (your welcome, neighbors! ), i went to my spot on the couch to grab my laptop, finding a card from sweetie on the computer instead. my smiles were great at 3:30 in the morning! sweetie took me to get my hair cut, a very short style i am so happy with, and to spend my gift card from michaels. i got some yummy colors from golden acrylics, some varnish and some fun washi tapes that will look nice hidden in some future paintings! 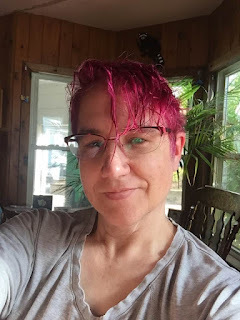 i went to sallies beauty supply and bought some pink hair color to get me smiling again, and on sunday we saw 'evil dead, the musical', which was raunchy, messy fun. 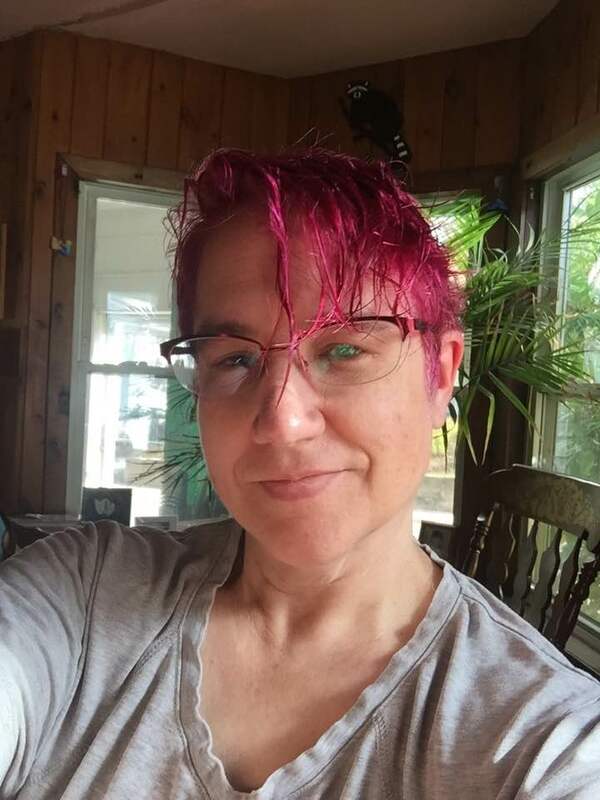 and, today i pink-ified my hair! yes, color is my happy place!